MY EXPERIENCE WITH A TYRE BLOWOUT. The media has been agog about tyre blowout for the past 2 weeks since the former Nigerian minister for trade and productivity died in a car crash which was said to have been caused by over speeding and a tyre blowout, may his soul rest in perfect peace. Well some of us have been in similar situations but were lucky to get out safely and unhurt. My experience was at the city of Ibadan one extremely hot afternoon last month in one of the notorious Nissan Micra taxis along with a lady and a man, I was on my way to Iwo road park where I planned to board a minibus to another city when suddenly, about 5 kilometers to the park and on high speed, we heard a loud bang by the right side where I was sitting. I immediately knew it was a burst tyre and I started repeating to the driver" don't step on the brakes!" as I knew that could be the difference between life and death. Luckily the driver did not match the brakes and he had just started to stir the car away from the middle of the road when the lady sitting at the front opened the car and almost jumped out of the car save from me who promptly held tightly to her cloth, this act enraged the man sitting beside me and he started to yell at the lady uncontrollably and all hell broke loose again. I was torn between looking out for the driver to avoid another car smashing into ours, preventing the girl from jumping down and killing herself and making the enraged fellow beside me to chilll...all these happened in about 10-20 second and I was surprised at how so many things could go south in such a short period of time. I was initially surprised at the decision the girl made and how the man kept adding to the problems by yelling when we were still in the face of trouble but really, who can blame the two of them? The girl was already in a full state of panic and apparently thought jumping down from the car was the safest decision since she could make and the man certainly thought he should chide her immediately instead of waiting and preventing further problems. The driver certainly has all the fault as I observed that the burst tyre expired about a year before the incident and he didn't even know that could be a dangerous thing. This brings me to the level of driver education and even passenger education in the country, while I certainly can't comment on the efforts being made to educate the citizens about how to react to emergency situations, I know more efforts have to be made to prevent avoidable deaths and injuries on our roads. 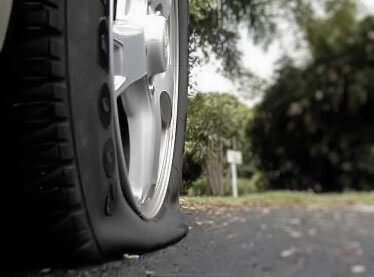 Incidents of tyre blowout are especially common during hot periods and special care needs to be taken to avoid them. I returned to Ibadan about a week later, stayed for some days and I witnessed at least 5 tyre blowouts mostly from cars and busses used to transport residents of the state. This is a very horrific trend and it might be a bomb waiting to explode if efforts are not made to arrest the nip in the bud before it's too late. In case you ever find yourself in a tyre blowout situation, here is what I think you should do. Your task is of course to stop the car as soon as possible, but so not to endanger other road users, pedestrians and to do so in a controlled and safe manoeuvre. In the event of a tyre blowout you will have lost 25% of contact with the road surface. Your car will also be far more unstable. Try to avoid sudden and abrupt steering or braking. Whilst keeping momentum of your vehicle by using the accelerator, keep control by keeping both hands on the wheel and you will need to ascertain an escape route. Use your mirrors – especially important if on a motorway as you will need to head towards the hard shoulder. Once you have established an escape route and your car is stable, very gently ease off the accelerator, but avoid using the brakes. If you have a car with a manual gearbox, you should try to change down the gears from high to low in order to reduce the speed of the car. Lift your foot off the acceleration pedal gently in order to slow down the car. This way the car will decelerate on its own. 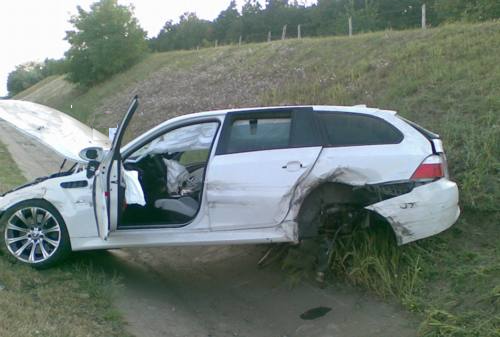 In any instance, try to find a safe area to stop the car at the side of the road or on the emergency lane. 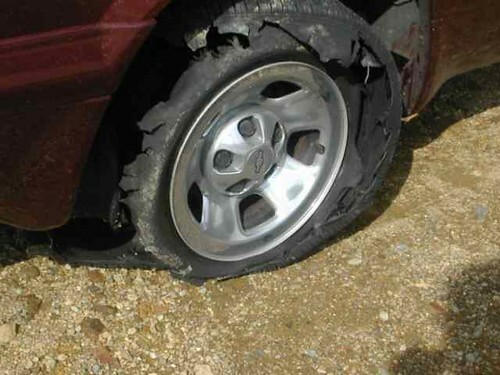 A tyre blowout is a terrifying experience, even for the experienced motorist. A blowout can on many occasions be unavoidable, but a little tyre maintenance and checks can help to avoid such an experience. · Regularly check tyre tread depth. Depth should be at least 1.6mm around the entire circumference of the tyre and at least across 3/4 of the breadth of the tyre to remain safe and legal. · Check there are no cuts or bulges either on the outer or inner edge of the tyres. These can lead to a puncture or tyre blowout so replace if necessary. · Avoid using old tyres. Even if a tyre looks in good condition, rubber deteriorates over time and can become weak. It is recommended to change tyres that are five years of age or over, even if they have had little use and appear in good condition. For more amazing articles, download CARVOLUTION MAGAZINE here and have the ultimate auto-mazing experience. I think a lot of tyre blowouts appears because of low quality of tyres. I am using Continental PremiumContact 5. You shouldn't use old tyres, it's a chance to avoid accidents.